TORONTO - The Los Angeles Clippers limped into Toronto less than 24 hours after their biggest regular-season comeback in franchise history. The Raptors were rested and ready. Kawhi Leonard scored 18 points and Toronto pounced on a Clippers team playing the second of back-to-back nights with an easy 121-103 win Sunday that spoiled Canadian rookie Shai Gilgeous-Alexander's pro debut back home. 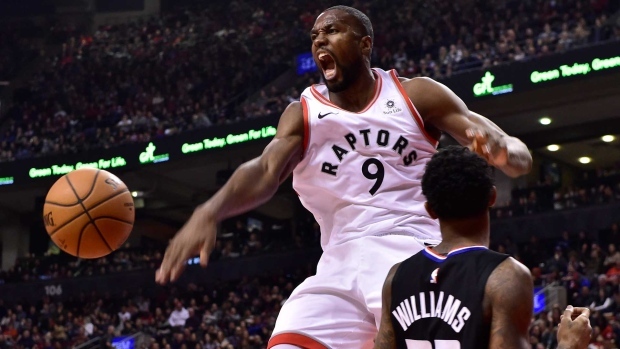 Serge Ibaka had 16 points and 12 rebounds, Pascal Siakam and C.J. Miles had 15 points apiece, and Delon Wright chipped in with 14 points for the Raptors (38-16), who were missing five-time all-star Kyle Lowry (sore lower back). Gilgeous-Alexander had 19 points to top the Clippers (29-25). “He came in and played great. He was the bright spot,” Clippers coach Doc Rivers said. Lowry missed six straight games with back soreness at the end of December, but had played every game since his return to the lineup on Jan. 6. The Raptors are 8-4 without their 32-year-old point guard, and didn't need Lowry on Sunday against a weary opponent. The Clippers had played the previous night in Detroit, overcoming a 25-point deficit to beat the Pistons 111-101. Rivers wasn't thrilled with the quick turnaround. “I don't complain a lot about scheduling, but this is ridiculous,” Rivers said. “We knew it would be as soon as we saw it. . . 5 p.m. We started last night. I think the league forgets; it's not 24 hours from the time the game starts, it's 24 from when the game finishes. Rivers was right. The show-no-mercy Raptors enjoyed a double-digit advantage for much of the night, and led by as many as 19 points in the third quarter before taking a 97-80 lead into the fourth. Toronto's bench closed out the game, and when Miles connected on a three with five minutes to play, the bucket put the Raptors up by 23, and it was all but game over. The Raptors are now 8-0 against teams playing the second game of back to backs. Their victory came on the heels of an ugly 105-92 loss to Milwaukee on Thursday for first in the east. VanVleet, who started for Lowry, said he had no idea if his fellow guard might be out for just the one game. “Naw, I mind my business, it's none of my business,” VanVleet said. VanVleet has had his own back troubles, and straps ice to his lower back when he's on the bench. Gilgeous-Alexander made the most of his debut, but the 20-year-old from Hamilton lamented the loss. Gilgeous-Alexander had more than 50 friends and family members in the Scotiabank Arena crowd. But it was the presence of Clippers owner Steve Ballmer, who'd also been in Detroit the previous night, and the team's president of basketball operations Lawrence Frank, that had social media buzzing. The Clippers are expected to be among Leonard's biggest suitors this coming off-season, and their attendance at the game north of the border prompted snickers on social media. The Raptors led virtually from the outset, taking a 12-point lead on a pull-up jumper from VanVleet eight minutes into the game. The Clippers closed the first quarter with an 12-0 run and the game went into the second tied at 23-23. Toronto kept the pressure on in the third, stretching their advantage to 19 points twice in the quarter. The Raptors shook off the Clippers with their own 14-2 run to begin the second quarter, and a Siakam running dunk put Toronto up by 16 with 1:41 left in the half. The Raptors took a 65-51 lead into the break. The Raptors play their next three on the road, opening Tuesday in Philadelphia. They'll visit Atlanta and New York before returning for a six-game homestand.